The Hidden Burleigh Bistro You Need To Visit, Stat! Think you know Burleigh? Well, think again. Tucked across the highway from the likes of Justin Lane and Harry’s is one of the Coast’s most hidden foodie gems. And although we’d like to keep it to ourselves, this spot deserves your attention. We’re talking about the Lebanese bistro, Rabbath. Have you visited yet? With just 28 seats and 45-square feet, Rabbath is officially the Gold Coast’s most intimate restaurant. 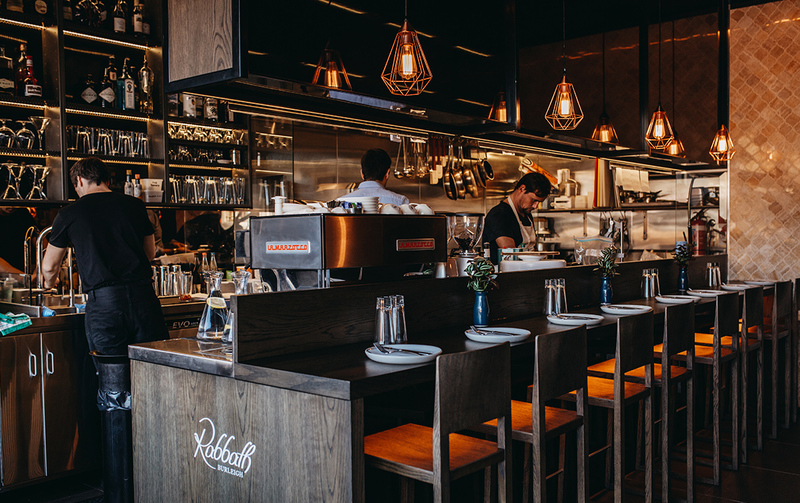 Everything has been custom made; from the wine display racks that hang overhead, to the compact kitchen and bar combo that occupies a third of the venue. There are old world Mediterranean mosaic tiles, cosy corners and soft lighting that’ll make you immediately feel at home. Owner Patrick Rabbath has got to be one of the most endearing and passionate local restaurateurs we’ve met in recent years. While he was just a baby when his family immigrated to Australia, he was raised in a Lebanese household and learnt traditional techniques and dishes direct from the hands of his beloved mother and father. Sadly Patrick’s mother passed just before he was able to open his restaurant, but he gently speaks of his parents with so much adoration and it’s heart-warming to know his tiny Burleigh bistro is a legacy to their name. We dropped by recently and managed to nab the best seats in the house, along the bar that fronted the kitchen. From here, we could interact with Patrick and his smiling right-hand man Eddy (ex The Fish House and Jimmy Wah’s). How many other top-end restaurants can you find yourself ordering direct from the source with your fresh-off-the-chargrill dishes hand-delivered across the pass? Entertainment and theatre is a cornerstone of Lebanese culture, and here, it is all on show. We’re the first to admit, we’re no Lebanese cuisine experts. The last time we dined at a dedicated Lebanese restaurant was years back, in Sydney. Right now you’re probably racking your brain what constitutes Lebanese food? Reality is, you’ve been eating and loving it for years now. Think: Middle Eastern signature dishes like koftas, falafel, hoummus, tabouleh, babaganouj and baklawa. As we often like to do, we left our decision-making in the hands of the experts. Rabbath has a chef’s selection tasting menu, where $49 will get you three courses (min two people) and basically a sampler of almost everything on the menu. Add another $29 per head and they’ll match with wine. 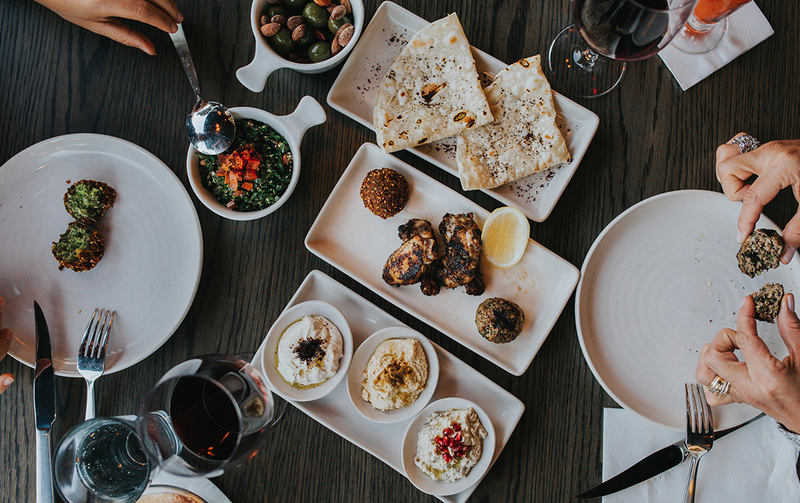 Much like tapas, Lebanese share plates are referred to as “mazze”, meaning to graze. We start out with possibly the simplest yet most delicious bowl of warmed Sicilian olives and smoky almonds (if you’re an olive fan, you’ll understand). Paired with the next-level L’Amour d’Espresso Martini using house-roasted beans and lovingly shaken by our bartender slash waiter Viktor. The exotic names roll on with Khoubiz (house-made Lebanese flat bread) served with a sampler spread of Kafta (char grilled lamb with seven spice), Jweneh (char grilled chicken wingettes marinated in garlic and lemon) and the house speciality of Falafel (a vegan favourite) that was crispy on the outside and moist in the middle. Each is paired with babaganouji, hoummus and tarator (tahini base) respectively. Patrick hands us a plate of M’jadara across the pass as he explains that the traditional dish of Egyptian-style risotto (caramelised brown lentils and rice) was once considered peasant food, and something his late mother was raised eating. But all this was just a precursor to the mind-blowing Bifteck; a thick cut of grass fed eye fillet that was swimming in a garlic and lemon butter or “samneh”. But, wait for it, Patrick assures us this Maleny Dairy butter is magically low in fat as it is clarified and uncultured. We don’t need to be told twice and spend the next 15 minutes dipping the most perfect of seven spice-crusted potato fries in the butter, between mouthfuls of eye fillet and Ban’jan (slow-cooked eggplant and tomato ragout). This is a not-to-be-missed dish, kapeesh? We’re kicking ourselves it took us six months to venture across the highway and step inside a gem that was tucked right under our nose. So we’re here to urge you, no, tell you, do not make the same mistake. Rabbath is open from 5:30pm Wednesday to Sunday; bookings are essential on weekends.